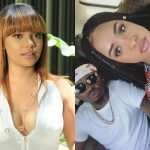 Diamond Platnumz is not ready to risk his relationship with Tanasha Donna. After staying quit about rumors claiming he is cheating on his Kenyan lady, the TZ singer has finally spoken. According to screenshots shared by the popular singer, he proves that he distanced himself from the popular video vixen Lynn a long time ago. Apparently the lass has been sending him messages and photos through his WhatsApp but warned her to stop now that he is in a serious relationship. He goes on to add that the bed Lynn photographed herself on is not his since she owns a similar bed. Done with drama Chibu Naseeb also states that he will not be involving himself with cheap stunts that will cost him his relationship. Well, this comes a few days after Tanasha Donna also came out to tell fans not to believe everything they hear or read on social media. Anyway checkout the screenshots below. The post Ukiachwa Achika! Diamond Platnumz shares WhatsApp screenshots showing how video vixen is forcing herself on him appeared first on Ghafla! Kenya.